Indonesia has some the world’s most sophisticated textile artworks. 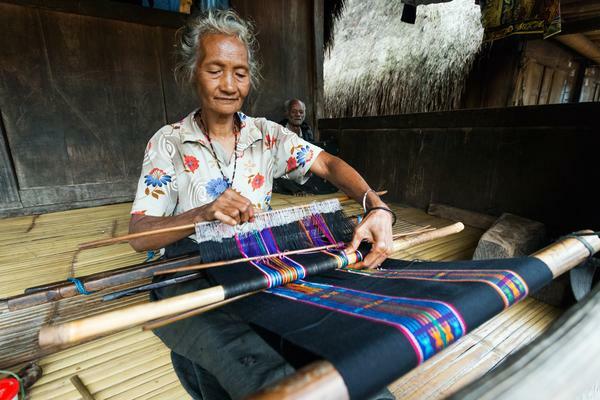 The ancient technique of ikat is still practiced and appreciated throughout the archipelago. 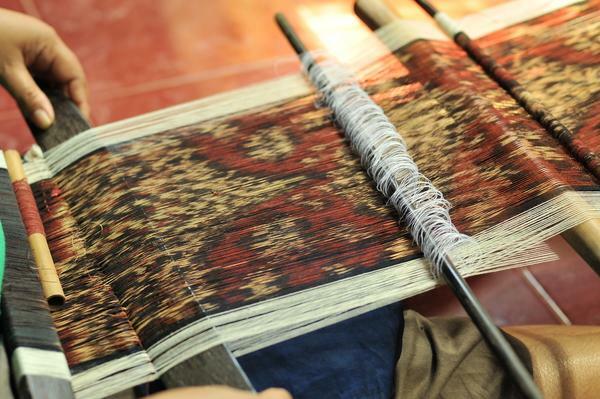 Along with batik, ikat weaving is a major constituent of Indonesian cultural legacy. The ikat resist dyeing process has possibly been brought from China to the rest of Asia during the expansion of sea trades. The word ikat means ‘to tie, to attach’ in Indonesian language. This artisanal method of dying and weaving fabric is known to many cultures around the world: Central America and South America, Uzbekistan, Iran, India, Japan and many other Asian countries. In Indonesia, the Lesser Sunda Islands are reputed for their traditional ikat although the technique is also practiced in Kalimantan, Sulawesi, Sumatra, Java and Bali. Just like some batik motifs could be worn only by certain social classes, ikat patterns bear symbolic meanings associated with social rank. As of today, an ikat cloth is still often included in a dowry. The ikat process starts by creating a pattern with a resist dyeing method. Bundles of yarn are wrapped together and dyed as many times as required to obtain all the colors desired. Depending on her choice, the weaver might dye the warp or the weft threads. To make double ikat, both the warp and the weft threads are resist dyed. Once the threads are dyed, they are woven on a loom. The motifs will emerge at this stage. The weaver needs to constantly readjust the yarn to ensure the pattern is formed correctly. Blurriness is characteristic of ikat fabric due to the extreme difficulty lining up the yarn. The fibers used vary from cotton, silk or wool depending on the region. The arduous process requires so much time and precision that it can take up to several months to complete a single piece of ikat. During the colonisation, Indonesian ikats were valuable goods exported to Europe by Dutch traders. The most famous ikat fabrics are the ‘hinggi’’ from Sumba island. In addition to their rich colors, they feature interesting animal and human figures. The motifs change in each region and the technique often differs too. For example, gold thread is used in some areas. Wherever you are in Indonesia, don’t miss an opportunity to admire weavers working on ikat. On the Lesser Sunda Islands particularly, go to villages with ikat home industry. It’s worth it!